In a scene which suggests Watchmen as one of the many possible influences (not just visually but in terms of the overall theme), we open to a middle-aged hero being shaken awake from his drunken slumber by an old acquaintance. But who is this slender hooded figure? Well, they turn out to be a former nemesis of our hero, Red Rocket Comet. But have they come to relieve their glory days by instigating another fight? To try and help our hero learn a much-needed lesson? Or are they here to remind him of something much darker? 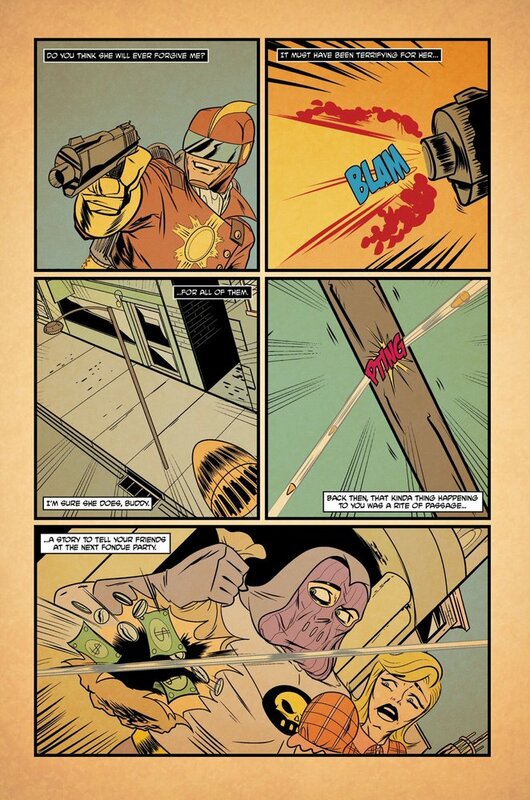 Matt Garvey, Grayham Puttock and Andy W Clift’s story has a unique concept with a familiar feel to it that will likely appeal to comic and literature fans alike. 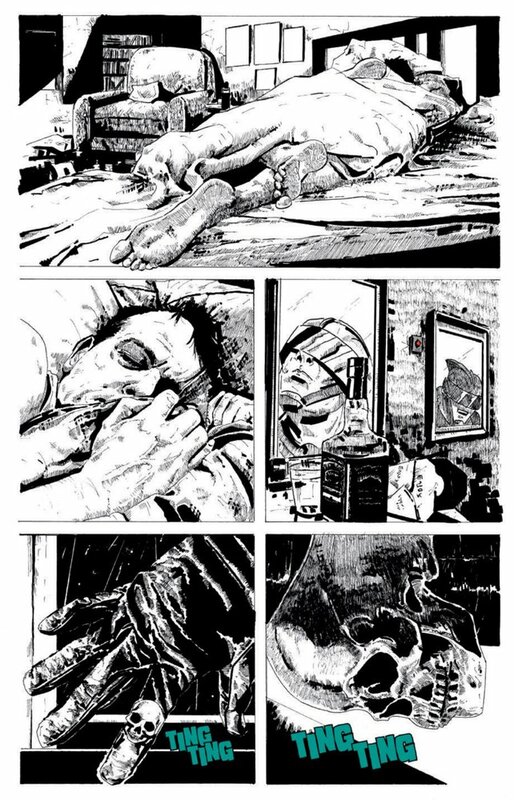 Taking its artistic inspirations from the likes of Watchmen and Sin City, the sense of dread is emphasised by its black and white aesthetic (albeit with the occasional drop of crimson blood thrown in for effect), while simultaneously paying homage to the classic Silver Age comic style. There’s a mixture of respect and parody for the archetypes on display here, and the slow devolution of the characters in the script fits perfectly alongside the artwork to emphasise both the steady realisations of pir former hero and the physical erosion of his former enemy. Actually, this story doesn’t feel unlike a modern version of Edgar Allen Poe’s The Tell-Tale Heart, with the guilt of the narrator and the beating heart under the floorboards being replaced here by a hero revisiting his own mistakes that have led him to a life of seclusion and alcohol. The steady beat of the story flows in such a way that I wasn’t sure where it was going until that single panel reveal, and after this point it starts to feel a bit like what would happen if The Comedian was visited by the Ghost of Christmas Yet To Come. So much so that I couldn’t help but hear Jeffery Dean Morgan’s voice in my head as I read through the pages. A truly unnerving joy to read. 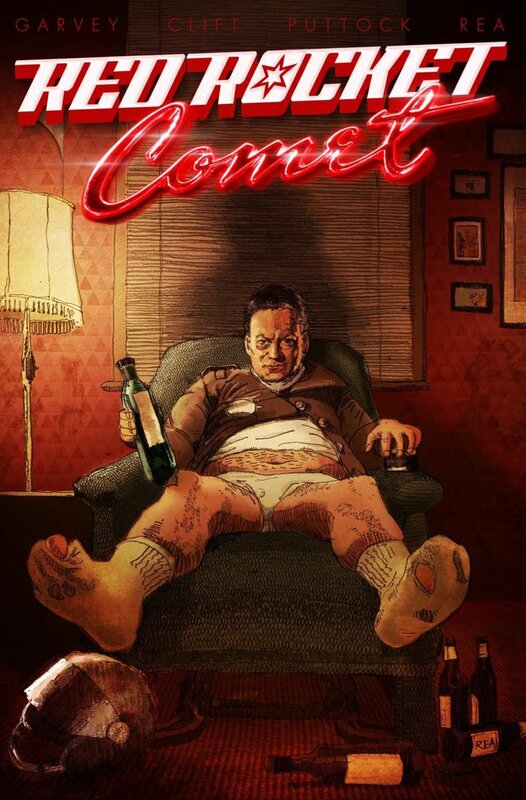 As well as being available on the Comichaus app, printed copies of RED ROCKET COMET #1 are also available from Matt Garvey’s Bigcartel Store (CLICK HERE).